There’s £400 of Snow+Rock vouchers up for grabs for the winners of our second reader writing competition of 2018/19. We know your heads are crammed with tales from the mountains: some happy, some heroic, some hilarious… some a bit weird, actually. Now is the time to reach inside that head and pull out your finest story, condensed (or extended) into 450 to 500 words. Well, only that it has to be ski or snow-related, and that it has to include an element of… surprise. However you like. First person, third person, past tense. Future subjunctive [say whaat? Digital Ed]. Poem. Fact. Fiction. Whatever. (Actually, maybe not fiction). 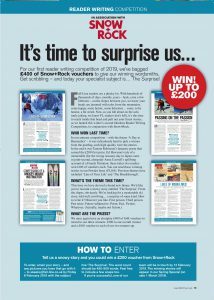 For our spring competition, we have £400 of Snow + Rock vouchers to award to our three winners: £200 to our overall winner and – because it’s so difficult to pick only one winner – two £100 vouchers for the runners-up. To enter, email your story – and any pictures you have that go with it – to skeeks@fall-line.co.uk by Friday 8 February 2019 with the theme and subject line ‘The Surprise’. The word count should be 450 to 500 words. If you’re successful, one of our team will be in touch by 11 February. The first winning stories will appear in our Spring Issue (on sale 1 March). 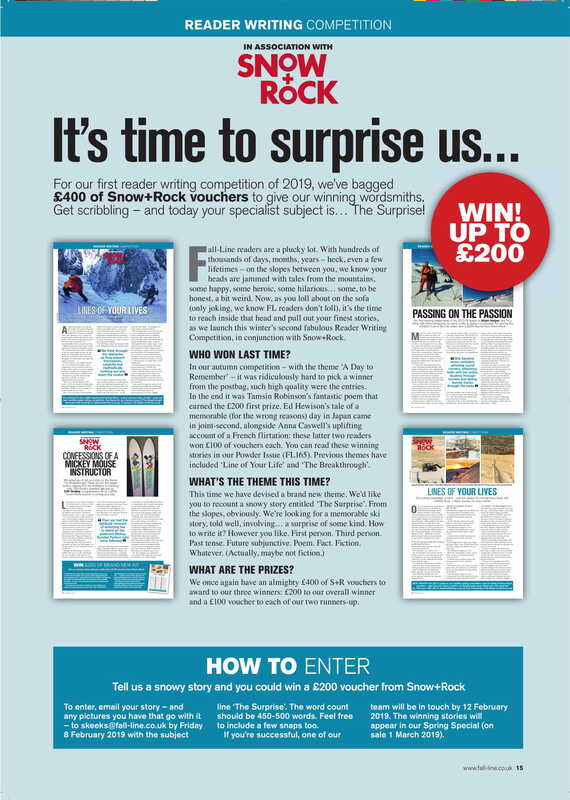 Line of Your Life: WIN £200 of Snow + Rock vouchers and get published in Fall-Line!